Hydraulic fracturing is used to improve the recovery of oil and natural gas by forcing water and specialized chemicals into the rock formation at extremely high pressures to a.) create or expand cracks (fractures) in the formation and b.) push proppant into those fractures to keep them open, which allows oil and natural gas to flow into the well more easily.Compass Fracturing brings together a team experienced in the deepest, hottest plays in North America with new equipment ready to handle all of the challenges of today’s large, horizontal, multi-stage fracturing needs. With history pumping high pressure, low sand concentration slickwater jobs and high pressure, high sand concentration crosslink gel jobs, CO2 and nitrogen foam, we can handle any type of job. Our fleet is designed to pump 100+ bpm with a double bank setup. Compass provides instant remote data transmission to any location so our customers can view the progress of our work real-time. From fluid systems to proppant to equipment configuration, our expert personnel will customize solutions to fit our customers’ needs. 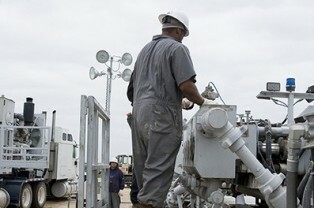 Compass offers superior fracturing services at competitive rates. Our top priority is your satisfaction. Our highly accessible staff is ready to give you a quote. Give us a call at 817.244.2555 to learn about what we can do for you. It starts with the way we rig up – Compass rigs up and rigs down faster than our competitors, which means less time on location, which means saving our customers money.